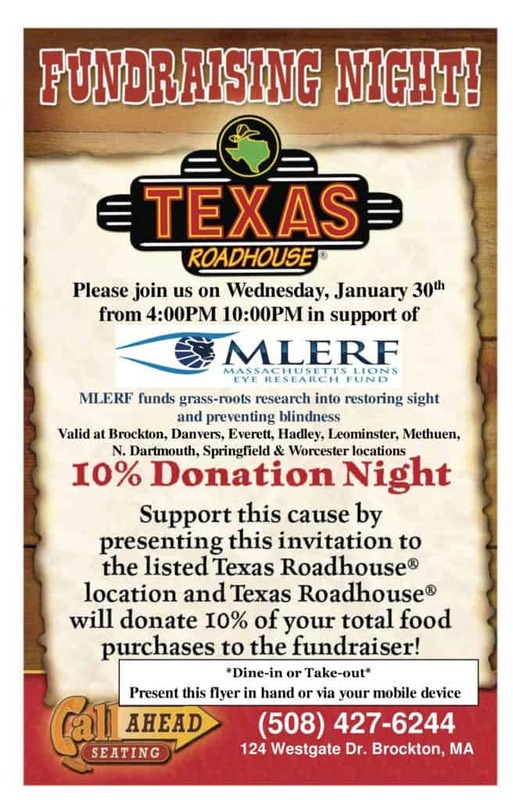 Support the Massachusetts Lions Eye Research Fund (MLERF) at the Texas Roadhouse Restaurant on January 30, 2019, from 4:00 pm to 10:00 pm. 10% of all purchases will go to support MLERF grass-roots research into restoring site and preventing blindness. Present the flyer below or show it via your mobile device. Valid at Brockton, Danvers, Everett, Hadley, Leominster, Methuen, North Dartmouth, Springfield, and Worcester, MA locations. © 2019 Lions Club of Easton Foundation, Inc.